I have posted this listing from the Walthers catalogue before and I am now indebted to Bob D from the States for sending me the following pictures of the sets of figures he has. The first five pictures show how the figures came in their boxes. And finally the underside of the bases, showing the stylised "G" marking. 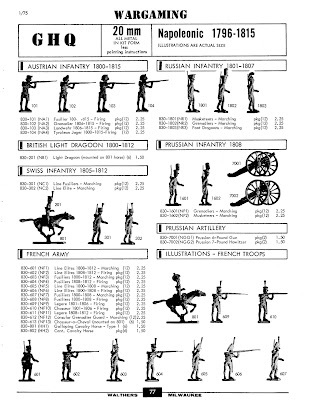 I have some packs (Prussian Fusiliers, Grenadiers and Dragoons) of the GHQ Guardsmen 25mm SYW figures manufactured in the UK by New Hope Design. These were sold in small plastic bags with card headers, and separate compartments for bodies, heads and muskets. I may post some pictures of these later if there is any interest. They are really something. I especially like the look of the separate head French, loads of detail. Rose horses came in two halves but didn't have a cutout. The saddles were cast on the figures and no reins were provided. Thought I'd posted some Rose hussars on my blog but can't find them - I'll do a repost. Thanks Rob. I must have misremembered, which means I probably have some more GHQ horses kicking around somewhere. I've removed the reference to Rose in the post, which probably means your comments don't make much sense now! 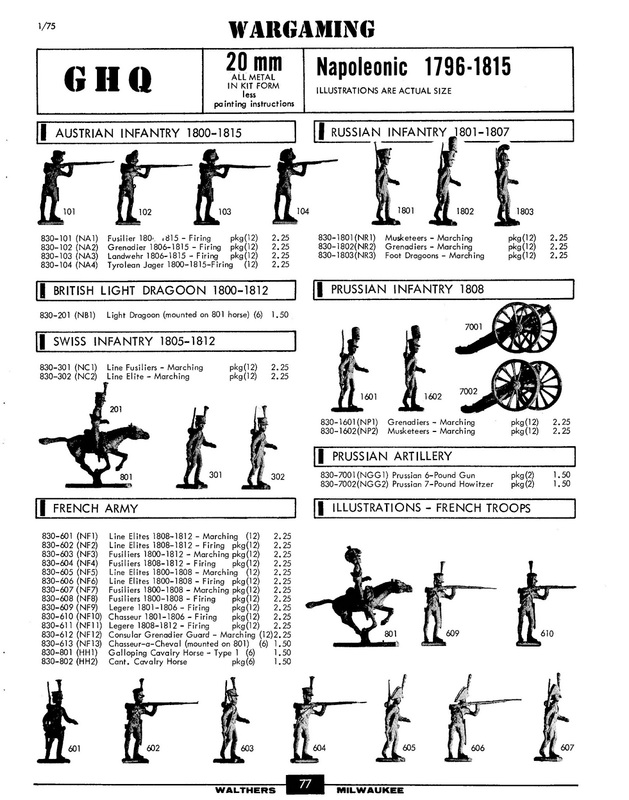 Thanks very much for posting these - interesting - I've never seen any GHQ Napoleonics before. I know from the VINTAGE20MIL site that these were "smaller and more delicate than Higgins" - they look nice - just how small and delicate are they? I have precisely one pack of the SYW Prussians (painted by a young Doug Mason) - lovely figures, but too delicate to survive many games. I'm used to my comments not making sense. At least these days I can blame age. What a splendid post. I've seen a few of these, but had no idea what they were. They were very nice figures. I just acquired a couple of boxes of these as well. I got them on a lark really, not knowing what they were, so am extremely grateful for your post. I got a set of line fusiliers marching and one unlabeled set, which I think are voltigeurs. They have what appears to be the hunting horn badge on the shako, but the plume is set off to the side, so was not sure if they might be Swiss. Would love to trade with someone who might be able to use them. I would like to be able to make a usable unit with them, so would need to have two boxes of the same type.